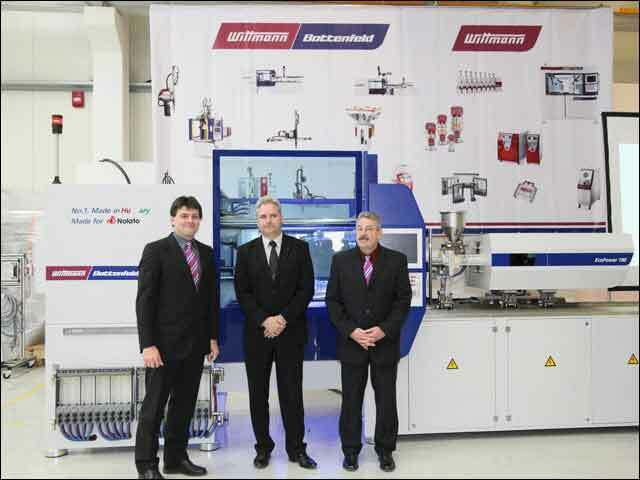 Wittmann Robottechnikai, a Hungarian subsidiary of the Austria-based Wittmann Group, celebrated the handover of the first injection molding machine being assembled at its Hungary facility on December 4. The machine, an EcoPower 180/130, was presented to Nolato, a Hungarian manufacturer of plastics products at its Mosonmagyaróvár, Hungary plant. It has 180 tons clamping force and a special automation package. This machine, the first produced in Hungary and the sixth delivered to Nolato, is also equipped for high-speed injection. Nolato is using the EcoPower for production of medical parts. Wittmann Battenfeld is also supplying several fully automatic production cells to manufacture parts under clean-room conditions. Wittmann has been producing robots and temperature controllers in Hungary since 1997. In 2013, the production capacity was extended by adding manufacturing equipment for low-cost series production of injection molding machines. The initial capacity is laid out for an annual production of 200 machines from the servo-electric EcoPower series.